Observe and measure the properties of a mineral sample, and then use a key to identify the mineral. Students can observe the color, luster, shape, density, hardness, streak, and reaction to acid for each mineral. There are 26 mineral samples to identify. Find the mass and volume of a mineral sample with a balance and a graduated cylinder. Calculate the density of a mineral sample by dividing its mass by its volume. Use a key to identify a mineral sample based on its properties. This version divides the activity into 5 teams, so each team is only identifying 5 minerals instead of al... (more)l 25. Great for practicing communication and teamwork skills! Here is a data table students can use for the remainder of the Mineral Identification Gizmo where they wi... (more)ll fill in information for Samples G through Z. On the front of the page, students test the properties of real minerals. On the back of the page, student... (more)s test the properties of the Gizmo minerals. As a whole class, we will compare our results and discuss our findings. This lesson takes the division out of the Density test and has students focus on measuing mass and volume... (more). 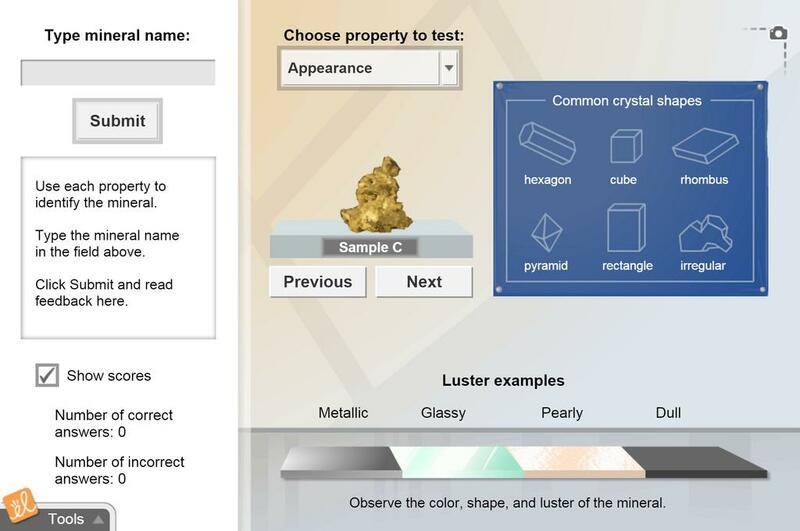 Enables students to practice at home and with more minerals than I can provide in class. Great way to teach students all the ways to test for mineral identification! Easy for 4th graders. We do Activity A together and Activity B with a partner. Sometimes mineral testing seems subjective to inexperienced students. This gizmo provides some "concrete" mineral assessment results! So much fun! Really groovy!!! My students loved this! Great way to identify minerals, and the lesson materials are excellent! If you do not have mineral samples, this is a very good Gizmo to show your students how to identify minerals.